PrivateVPN is a great all-rounder with excellent privacy and high speeds. It also unblocks streaming sites like Netflix and is suitable for torrenting. PrivateVPN is a relatively small Swedish-based VPN provider. With only around 100 servers up and running, it claims to be the best VPN for streaming, privacy, and security. With Netflix cracking down on VPNs, the streaming claim is a strong one, but PrivateVPN is confident enough to offer a full 30-day money-back guarantee on all packages. This is higher than many other VPNs on the market and competes with top-rated providers such as ExpressVPN. Although its server numbers are small, they appear to be well-placed. And this provider goes big in other ways, including offering multiple encryption options to suit your specific needs. So let’s see how it stacks up! Reader discount: PrivateVPN is currently offering our readers an 83% discount here, including 12 months free. You can get access for 24 months at $1.89 making it one of the cheapest VPNs on the market. Alternatively, you can opt for shorter terms of three months at $4.50 (GBP £3.32) per month or one month at $7.12 (GBP £5.25) per month. A 30-day money-back guarantee is offered on all of these packages. If you don’t want to part with your payment details just yet, you can also try it for free for 24 hours; full details of the free trial can be found here. Without our reader discount, plans are about average price, ranging from $3.88 (GBP £2.87) per month for an annual plan and $7.67 (GBP £5.66) per month for a monthly plan. These prices cover up to six devices, whereas many other providers only allow five or fewer with standard packages. Payment can be made using most major credit cards, PayPal, or bitcoin. PrivateVPN also offers a referral scheme whereby you can earn points (exchangeable for credit) when you get others to sign up. Apps are available for Windows, MacOS, iOS, and Android. There are also instructions for connecting through Linux, Amazon Fire TV, and OpenELEC Kodi. If you want to secure every device in your home continuously, you can even install PrivateVPN at the router level. Like many other VPN providers, PrivateVPN provides IPv6 leak protection, DNS leak protection, and a built-in kill switch. One standout feature with this VPN that you don’t often see is that you can choose your protocol depending on how and where you want to use it. For example, if you want to connect in China, you can opt for the L2TP protocol, since other options will likely be blocked by China’s firewall. If you’re wondering about torrenting, PrivateVPN states in its FAQ page that it allows P2P and recommends using its Sweden servers for this purpose. It offers unlimited usage and bandwidth so you won’t have to worry about that side of things, either. Adding all this to its streaming capabilities, this provider really does prove to be a solid all-rounder. 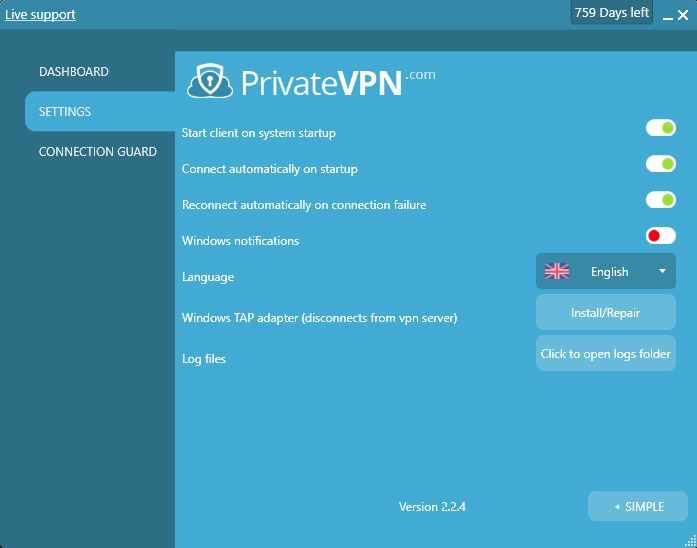 The PrivateVPN website includes a full step-by-step installation guide (including downloads and screenshots) for every configuration it offers. Simply go into the Installation Guide tab and choose your operating system and protocol. Then follow the steps to download and install the VPN on your device. For the purposes of this review, we will be using the standard PrivateVPN APP setup with Windows 10 and iOS. Once you’ve downloaded and installed the VPN, you’ll be asked to restart your computer. Then you can search for and run the application, which will prompt you to enter your login details. Once running, it will be accessible from the taskbar or tray. The interface itself is very simple, with few options. The main screen enables you to select the location of the server you want to connect to. Aside from the country, you can also see which city the server is located in. Some VPNs don’t offer this information, but it can be helpful, especially if you’re trying to find the geographically closest server to you. If you click on Advanced in the main screen, you’ll see a few more options. In the Dashboard tab, you have similar information to what you saw on the main screen, in addition to your connection type, port forwarding, and connection time. Here you can change your server location and connection type using the dropdown menus. Just note that you have to make sure the VPN is disconnected before you can make those changes. If you try to do it while connected, the dropdowns simply won’t expand. Under the Settings tab, you have a few connection options to control, a language setting (although English is the only option), and a link to your log files that are stored on your computer. Finally, in the Connection Guard tab, you have the option to disable (they’re enabled by default) IPv6 leak protection, DNS leak protection, and the kill switch. The kill switch acts as a safeguard to shut down certain applications if the VPN connection is lost. The application will restart automatically once the connection is regained. 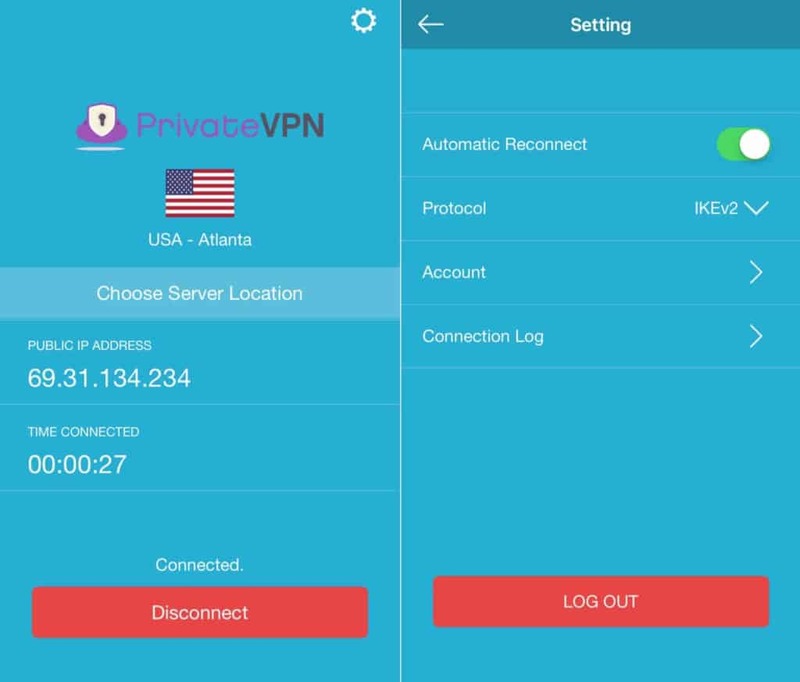 There are fewer bell and whistles than some other VPNs we’ve tried, but overall, this app is intuitive and has all the options you really need. The mobile version is a little lighter on features than the desktop. In the main screen, you can change your server location, view your IP address, and see how long you’ve been connected. If you click the gear icon in the top right-hand corner, you’ll land in the Setting tab. Although, the only actual settings here are an option to disable Automatic Reconnect and change your connection protocol. Other than that, you can access your account information and connection log (which you have the option to clear). There’s definitely nothing wrong with either app, but they’re lacking features that some users may miss, such as ad and malware blocking options. PrivateVPN’s website states that it has 80+ servers in 56 countries. According to the server list, this includes multiple in some European countries and six in the US. The number of server locations in terms of countries covered is higher than for many other providers. However, the total number of servers is tiny compared to say ExpressVPN with over 1,500 or CyberGhost with more than 1,200. Thankfully, the small network of servers doesn’t correlate to poor performance. We were able to stream 1080p video seamlessly with no buffering while connected to servers in New York, Los Angeles, and London, from the test location in Canada. There were also no issues when playing games using the same servers. Connecting to different servers rarely took more than a few seconds, and there were no dropped connections observed while surfing, downloading, or streaming. When running our speed tests, the aim is to be as empirical as possible. We use a test server in Canada and connect to servers in various locations (the US, the UK, Australia, Hong Kong, and Germany) for each provider. We download a test file of roughly 50MB in size from a US server. This is repeated four times per day (at six-hour intervals.) for each test server. The average download speed for each test is recorded and the aggregate data is displayed in the interactive chart below. The first tab (labeled Simple), shows median download speed. You can see here that PrivateVPN has one of the fastest median download speeds of any of the VPNs we’ve tested. You can view a more detailed version of our results when you switch to the Detailed tab. Here, you can see that the spread in results for PrivateVPN is a bit bigger than you see for other providers so you may see quite a bit of variation in speeds. Even with its small fleet of servers, PrivateVPN is one of the few VPN providers that can currently unblock Netflix. We tested it with Windows, iOS, and Android, and they all worked seamlessly. PrivateVPN even marks certain servers in its list that will work with Netflix and other services. This is welcome news since Netflix seems to be cracking down on VPN users accessing from different parts of the globe. PrivateVPN is clearly not immune to this as some servers don’t always work, but you can simply visit the website for a handy up-to-date list for which servers aren’t blocked at the current time. As well as Netflix, we were able to successfully unblock other streaming sites. These included BBC iPlayer, Hulu and Amazon Prime Video. With so many VPNs being blocked by China’s Great Firewall, it’s pretty slim pickings when trying to find one that will work reliably. Fortunately, thanks to PrivateVPN’s vast number of configuration options, you should be in luck. In its FAQ page, PrivateVPN advises that you use L2TP for connecting in China. This is because OpenVPN and sometimes PPTP are typically blocked easily by the country’s firewall. Bear in mind that some VPN sites may be blocked in China, so make sure you know how to switch to L2TP on all of your devices before you travel. You can toggle within the apps, but just in case it doesn’t work, the website provides guides for installing manually. PrivateVPN also work in the UAE and the wider Middle East, where many other VPNs are blocked. Being based in Sweden, PrivateVPN would be subject to some pretty stringent data retention laws. However, this provider says it never stores logs of data traffic so it couldn’t cough up any records even if it was asked to. To sign up, you’ll need to provide an email address and password, and you can pay through Stripe, PayPal, or bitcoin. Details will be used for account correspondence and potentially for promotional materials but are never shared with third parties. As for data security, PrivateVPN uses 128-bit CBC encryption for TAP and 256-bit AES for TUN on the default OpenVPN protocol. Both of these are effectively un-crackable, although 256-bit is the stronger of the two. SHA256 is used for authentication, in conjunction with 2,048-bit RSA keys. Additionally, 2,048-DHE keys are used to provide perfect forward secrecy. Depending on which device you’re using, you’ll have several different encryption options, including IKEv2, L2TP, and PPTP, IPSec, and OpenVPN – Viscosity. You can toggle between these in the Dashboard tab in the desktop client or Settings screen for the mobile application. A kill switch is enabled by default, so if the VPN connection happens to drop, internet traffic will be blocked. This acts as a backup to ensure your data remains private. If you’d rather not have this feature activated, you can turn it off in the Connection Guard screen (within the desktop client). 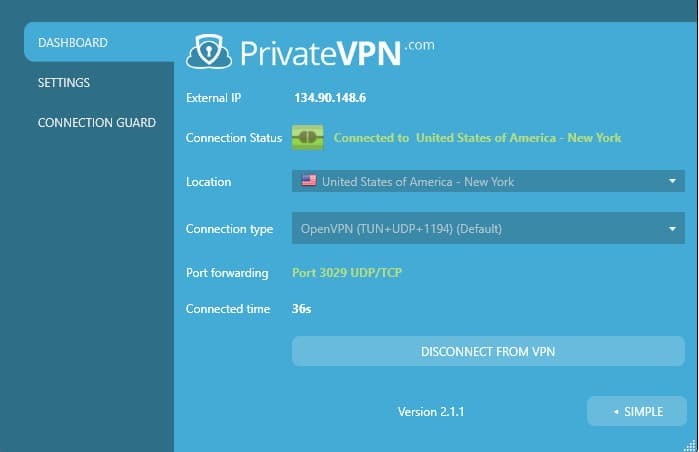 PrivateVPN protects against IPv6 leaks and DNS leaks. PrivateVPN used to use Google DNS servers but has since set up their own. With Google DNS servers, Google has the ability to track what websites you visit when using the VPN, although it won’t know your real IP address. Now that PrivateVPN has fully implemented its own servers, this is no longer a concern. PrivateVPN promises a live chat service and remote control support for setup and troubleshooting. They claim it’s 24/7 but there were occasions (mostly weekends) when we visited the website and it was unavailable. In one such instance, we contacted the support desk on a Saturday and the response time was 1–4 hours. This isn’t bad and they did apologize for the slow response, but it’s not quite 24/7 live chat. In addition to live chat, PrivateVPN also offers remote control support for help with setup and troubleshooting. This is especially handy since some of the protocol options require setups that go beyond the standard installer wizard. Although it’s not 100 percent reliable, the live chat and remote control support are certainly selling features and make this is a great option for beginners and advanced users alike. 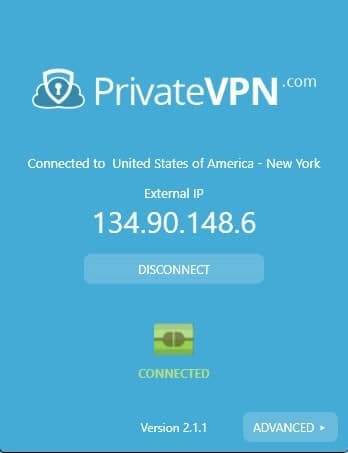 I tried PrivateVPN yesterday in China, it works very well, and customer support give me a link to download their beta android application, so I can use the “stealth vpn” feature to connect to vpn server, they don’t have an application that is as easy to use as ExpressVPN, but they have a lower price, overall, their service satisfy me. Don’t know where you got these screenshots from, is this what it looks like? No install no support they only got my money, my bad was to expect something for my money. Didn’t think I was going to get screwed by Swedes today. I´ve just signed up for PrivateVPN and the screenshots shows more or less how the app looks today. There is a “Live support” link in the upper left corner though. The app is pretty much a set and forget kind of app. Install it, log in and go. I´ve had a couple of other VPNs before (Anonine, NordVPN also quite good providers) and I was surprised how blazing fast the login is. While it takes about 20-30 seconds to get a VPN connection in the others, with PVPN it connects in a second or two. Maybe thats because they dont have so many servers to go through while looking for the fastest one? Also big difference in connection time to foreign Netflix, its almost as fast as without a VPN, the films load fast and the buffering doesnt take that long to get a good picture quality. I´ve only been using it a couple of weeks (including the 7 day trial) but I have no complaints so far. This review is a bit old and I think it looks a little better but more or less the same now.